Stepanakert, Artsakh – “ On September 1, 2017, a Canadian delegation headed by Rev. Majed el-Shafie, founder and president of One Free World International, and Members of Parliament the Hon. Tony Clement and Ms. Rachael Harderâ€” shadow ministers of Public Services and Procurement and the Status of Women, respectively, concluded their four-day fact-finding mission to the Republic of Armenia and the Republic of Artsakh. Accompanying the delegation was the Republic of Artsakh’s permanent representative in North America, Mr. Robert Avetisyan and the Executive Director of the Armenian National Committee of Canada (ANCC), Sevag Belian. 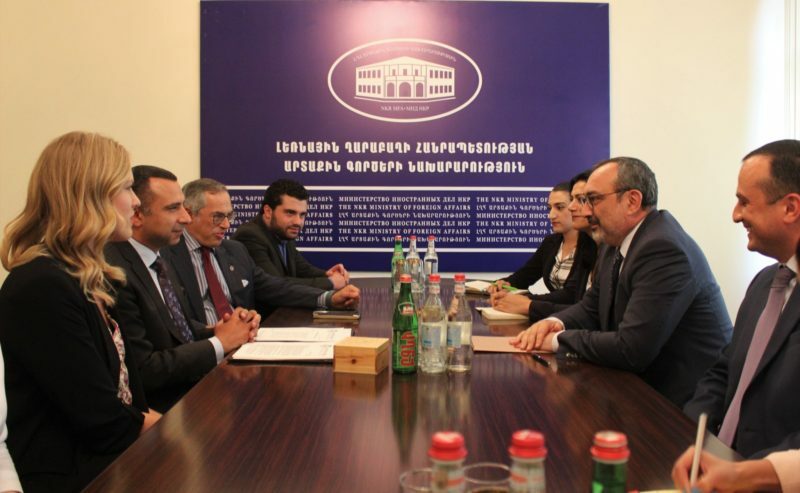 During their visit, the delegation held several meetings with high-ranking officials from Armenia and Artsakh, where bilateral relations and current developments in the ongoing peace process were discussed. “This visit and the delegation’s special investigation into the war crimes committed by the Azerbaijani armed forces during the April aggression reveals important information for the international community to consider and learn the reality behind this conflict” said Belian. “Our expectation from the Canadian government is to continue its balanced approach towards the peaceful settlement of the conflict through the framework of the OSCE Minsk Group, advocate for the establishment of monitoring mechanisms along the line of contact, and encourage the participation of the Republic of Artsakh in the negotiation process, which is the only fair method to reach a viable settlement of the conflict” added Belian. Shortly after their arrival in Artsakh, Rev. El-Shafie and the parliamentarians were subjected to slanderous attacks by the Azerbaijani Foreign Ministry, eventually being placed on Baku’s infamous “blacklist”. Meanwhile, Azerbaijani state media falsely accused the ANCC with defamatory accusations of sponsoring the trip of the delegation. On September 1st, the delegation concluded its four-day trip at a press conference held at the National Assembly of the Republic of Artsakh, where they presented the preliminary results and impressions of their mission to local and international media outlets, specifically noting their reiteration to continue advocating for the peaceful resolution of the Artsakh conflict and the fundamental rights of the people of Artsakh.